Many writers have written on theory of knowledge, history, psychology and logic, as distinct area of inquiry, in the course of their careers. David Hume and Bertrand Russell come to mind, as examples of those who wrote on history and philosophy in separate works. 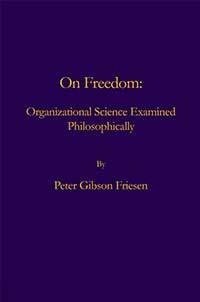 Peter Friesen, in a unique fashion, writes not only about the above areas of knowledge, but presents an historical, and developmentally unified theory of individual and social development, based on the theme of human freedom, the title of the book. Friesen does not attempt to situate his insights within complete historically articulated frameworks, focus upon a number of writers -- Plato, Freud, Lawrence Kohlberg, and Abraham Maslow -- who present multi- disciplinary views of human and societal development within unified and single frameworks.